Besides the FLIR ONE thermal imaging accessory for iPhone 5/5S there is another product from FLIR that uses the affordable Lepton micro thermal imaging sensor – the FLIR TG165 Imaging IR Thermometer. Note that FLIR calls this device an Imaging IR thermometer, but it is essentially a low resolution thermal camera with a bit limited functionality. 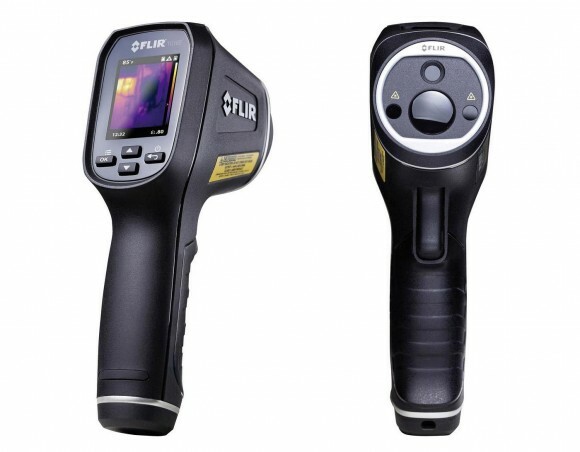 What the device does is provide you with a thermal image with a resolution of 80×60 pixels with a center spot meter report of the temperature that you point it at, so you get the best of both worlds – a thermal image for more accurate measurements and a precise infrared thermometer in once device. Unlike a traditional spot only infrared thermometer with the FLIR TG165 you can also save thermal images just like with a thermal camera. It is not as functional and feature rich as a full fledged thermal imaging camera, but for the price of $499 USD you can really get a very powerful device for measuring temperature accurately.